Here are a few things I observed on my lunch time walk today. This won't help you plan your visit to Reno but you might find it interesting if you are keeping upon the hometown developments. Things are going great guns at Whitney Peak. Lately there have been lots of delivery trucks and Dumpsters beside the building for taking stuff out and bring stuff in. I looked in an open door today and saw that the entire first floor is stripped to the walls. That might not be a big development since everything in there was pretty bare anyway but at least it means they are not just making minor cosmetic changes. Next door I could see no activity at Siri's casino, except maybe a fresh coat of paint on the exterior walls in the alley. No trucks parked back there or signs of any construction. They had better get going pretty soon the if they are going to open by spring. Around the block at the northeast corner of Sierra and W. Second (I don't know what casino this used to be, but it now houses a dance club called Rise and several empty spaces) the empty space at the very corner bears a sign saying it is leased and there appears to be significant construction going on inside. I have no idea what it is going to be but it bears watching. Back then Virginia street, the big news a few weeks ago was that the developer has purchased the Virginian with plans to reopen it as a non gaming hotel. This developer has a good record for rehabilitating defunct Las Vegas properties and is also upgrading property in Reno on W. First near Arlington show that bodes well for the Virginian. However, there was no sign of any activity in the building today. I checked out developments at the post office building across the river. This is another one that is really moving along on schedule. Everything was stripped out on the first floor from what I could see, but there was heavy equipment on all sides changing windows and upgrading plumbing. The basic on landscaping has also been upgraded to match the original design. When completed this year is expected to have upscale retail and dining on the first floor with office space above. No word yet on any occupants but there is already a sign on the door offering office space for rent. All in all these are all seemingly positive developments for downtown Reno. On Second Street's NORTH side (with the South side the former Riverboat) is what was twice called "Eddie's Fabulous Fifties" with a 1950's Fonzie's Malt shop kinda look. It has since been home to a couple of Rave music kind of college joint. Last time I saw it, the outside was painted red. Thanks Remano- always good to hear how things are going there. Do the Casinos seem like they are staying busy? We are working on planning trip in March and they sure don't seem to be giving those flights away or the rooms either for that matter. Still sure looking forward to it. Thanks again for taking the time to post. Always appreciated! Eddies was originally the Money Tree. 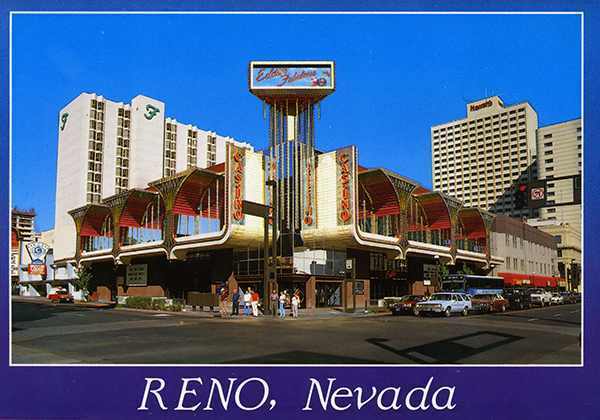 It closed about three years before I set foot in Reno. I enjoyed Eddies, but it was very short lived. After it closed I think it became "Reno Live" - sort of a dance and sometimes live music joint with a bar or two. There was even few machines for a while. I enjoyed the music there a few times and eventually took my wife there. She hated it and the place went downhill fast after that. JD - that's the place, and it's still red as can be. The nightclub is upstairs. There was some kind of fitness gym on the ground floor for just a short while a few years ago, but it folded pretty quickly. Other than that, the ground floor has been vacant for the last 10 years or so. Dave - the casinos have seemed pretty busy the last several weeks, but there's been quite a lot going on - New Year's Eve, bowl games and national college championship, NFL wild card weekend, one of the country's largest youth wrestling tournaments, NBA D-League national showcase etc. I think it's kind of hit or miss otherwise, just depending on what's going on when you're here. If you're planning to be here for March Madness that should be pretty lively. FWIW, there was an article in the paper last week saying Washoe County casinos showed a profit last year for the first time in 5 years, but it was mostly from reduced overhead, not increased business. Gross revenues were almost the same as the year before (down something like 0.15%). Statewide, the largest casinos in Nevada (mostly Las Vegas) lost over a billion dollars. And I know what you're saying about the cost of flights, but from what friends and relatives in other locations are saying, it's not just Reno. It seems the trend in aviation generally is fewer flights and higher fares. Still, I hope you can put together a wonderful trip. We are working on planning trip in March and they sure don't seem to be giving those flights away or the rooms either for that matter. Still sure looking forward to it. I will be bowling at the National Bowling Stadium on May 10/11, and flights from Milwaukee are $433 today (which stinks, as I have a $329 Southwest credit... I hate paying with real money). Also, I have NO Harrah's comps for that weekend. And for what I lost in their casino, I can't believe that. I will probably contact a host as the time gets a little closer. A few years ago, you could sign up for some casino cards on line. That might put you on a mailing list that would send automatic offers...MAYBE. I'd try Eldo, Silver Legacy and GSR for sure. It's been years since I got any decent offers from Harrahs and I always try to keep it active. Be sure to get a Siena card (not sure if you can do it before your trip) but I seem to recall they give great comps for new sign ups. Don't forget the Circus-Circus. Being somewhat out of the way, I would think they would have good deals. The Sands is a big unofficial supporter of the Professionals Bowlers Association. When PBA events are at the National Bowling Stadium, the Sands management trips over themselves to get the bowlers to stay there, including use of conference rooms just for guys to hang out and store bowling balls, and the use of shuttles almost as a limo. Among bowlers, there are lots of stories about how great the Sands is. I just never stayed there because I've had Harrah's comps. I did stay at Circus Circus in '95 and '07 and it is a nice place. Stayed in almost the exact same room, as I have pictures of the Sundowner from almost the same angle. I signed up for the Siena card last May, I must not have spent enough time there as I haven't even earned a mailer. They said the matching-loss promo reimbursement will be on my card for a year, so I will avail myself to that bankroll adder. Thanks Remano. Got the flights booked. Actually the rates dropped a bit and I got on it at pretty reasonable rate. Down with Alaska and back with SW. It's funny you say that Mjames as I do always remember a lot of bowlers at the Sands and they sure made them feel welcome with drink specials etc..
Haven't ever tried this before but I am actually thinking of trying Hotwire out this year for booking our rooms. I was hoping to stay at the Eldorado (where we have been the last few year) or the Silver Legacy. From what I can tell from the amenities and the hotwire help forum I think I can get either on of those two for about $100 cheaper for 4 nights. Have to see how daring I am but don't think I can go wrong. Then again whenever I think that it always does seem to go wrong! I am booking for 8 guys - 4 rooms so that could really make it interesting. I will be sure to let you guys know if I do and what I come up with but if the prices don't drop I may just roll the dice. Sure looking forward to coming back down!